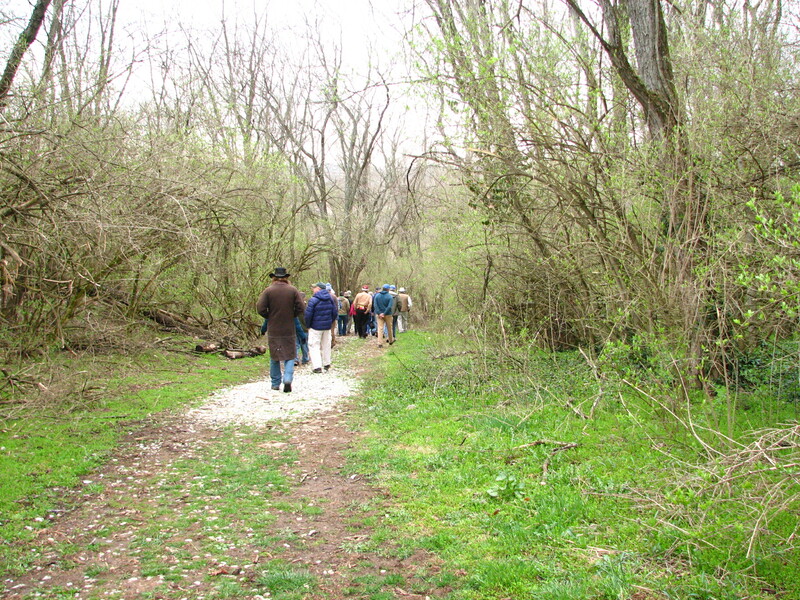 This last Sunday morning I joined 30+ avid birders at Spring Valley Wildlife Area as the Ohio Ornithological Society joined forces with the Cincinnati Bird Club for this early Spring trip to one of my favorite places. And it’s right in my backyard. 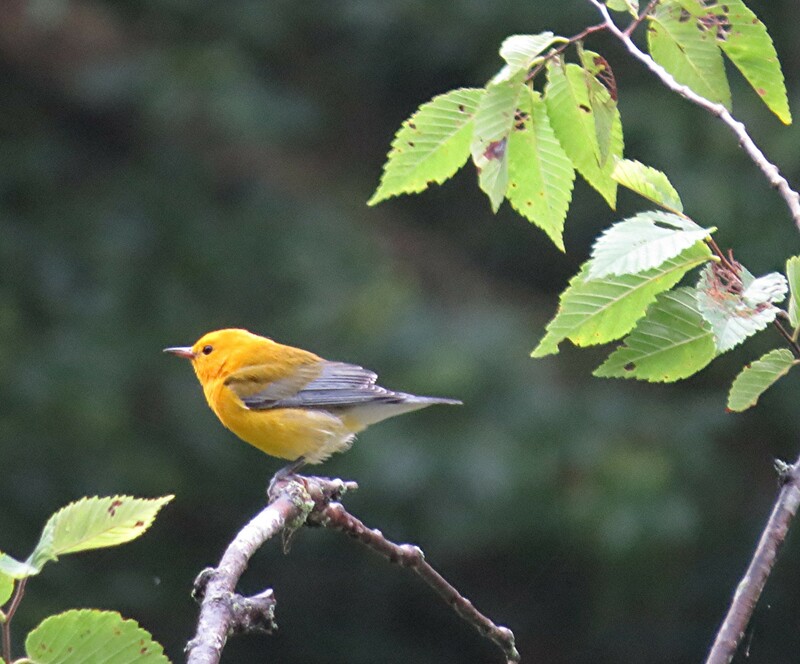 So at 8 am a group of us birding explores left the McDonald’s and drove north to our destination, where we joined many more birders already there scoping out the area around the parking lot anticipating the arrival of our group leaders for the day. After assembly was sounded and all the proper introductions were over we set off down the trail towards the decaying boardwalk. You see, during the final set of instructions were given to the mass of birders , one point was brought up about the boardwalk. The need for replacement and the state of disrepair it’s presently in. So our group leader advised that since we had such a large group it would be wise to space ourselves out so as not to add to the strain by the sheer bulk by this group of people. As you can see I sort of hung out at the back of the pack waiting to make my move. No, not really. For myself have difficulty with too many people talking and the constant crunching of feet on the gravel path. It’s not that I’m anti-social, I just like to hear the birds as well as see them. The progress was slow as you might imagine as we stopped along the way to spot birds and to talk about them. With a group this size, with all levels of skill, it’s stops like this that keep the more novice birders interested and coming back for more. 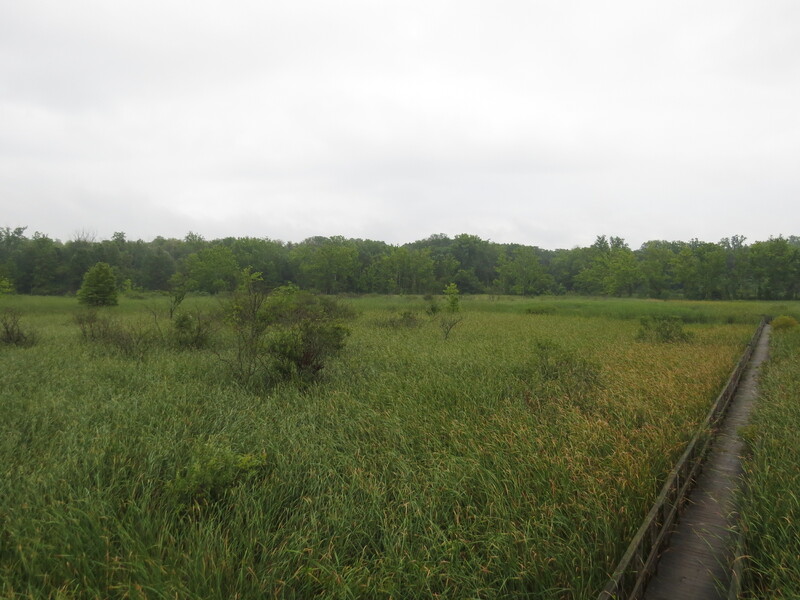 All the common species were seen on both sides of the path leading to the boardwalk with the exception of Warblers. Far too few, or just too early. Either way as soon as the group hit the boardwalk, people started to spread out a bit. 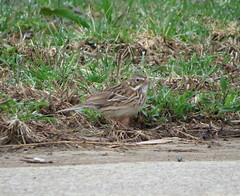 Some went to the observation and the rest, myself included, was satisfied with staying near my favorite spot and wait. And what am I waiting for you might ask? 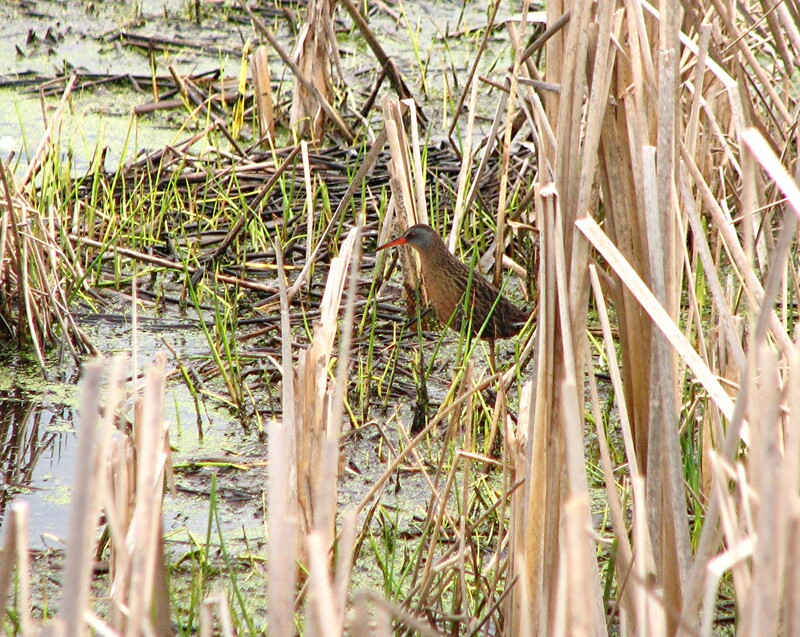 Marsh Wrens, Soras and Virginia Rails. 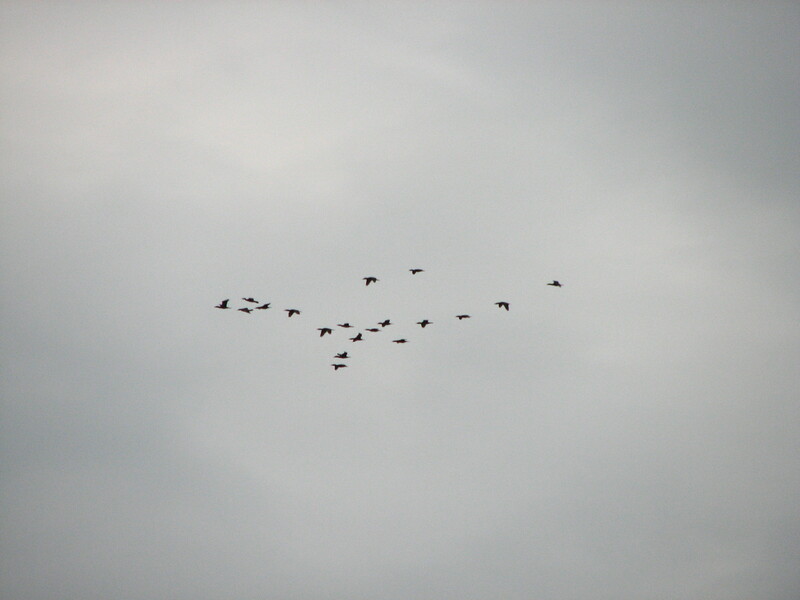 A fly over of a group of Double-crested Cormorants. They were flying in a nice and neat V formation, however when they saw that I was going to take their picture, they broke up the formation. 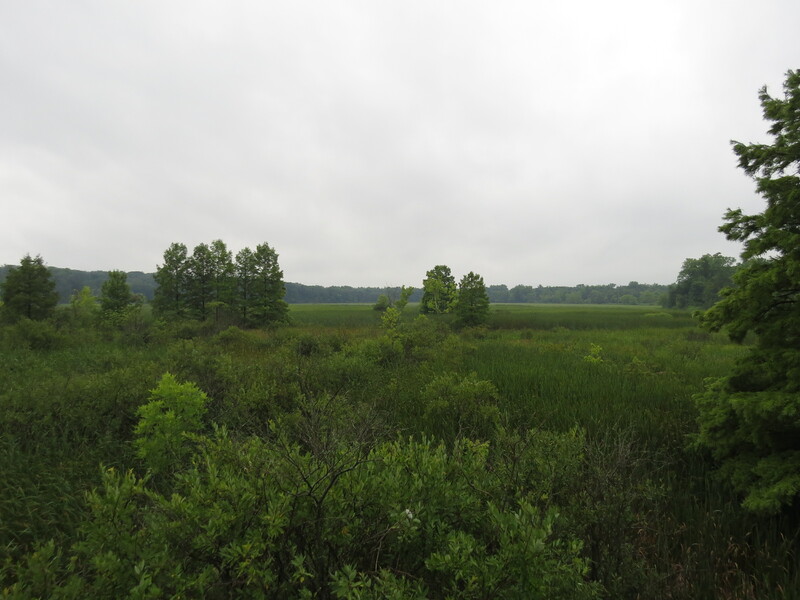 We were there for about 30 minutes when the first of several calls from the Marsh Wren were heard. And it wasn’t soon after that the first one was glimpsed briefly. 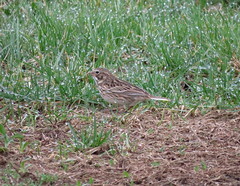 A very dependable bird year round since Jon and myself saw them back in December and again in March. 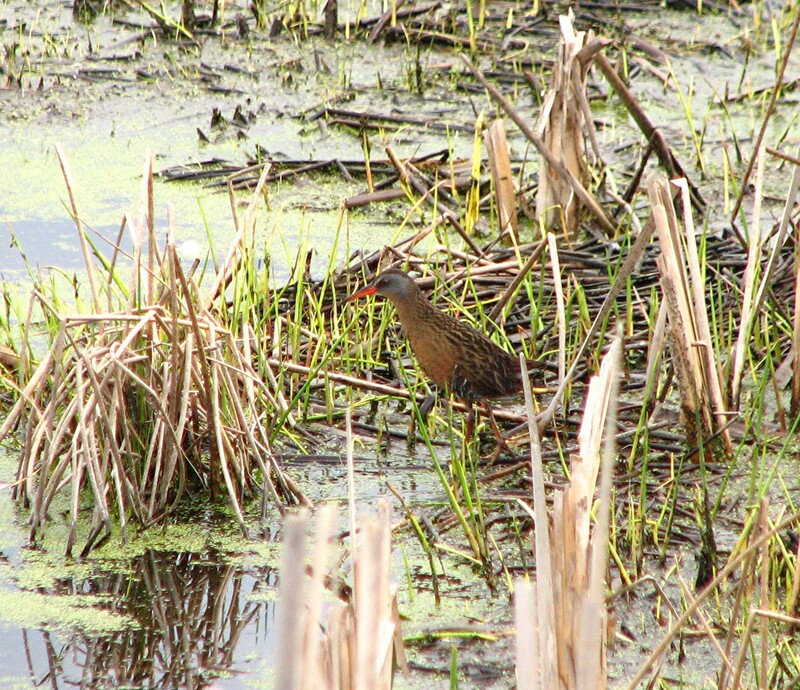 But my sights were set on the Virginia Rail and Sora. 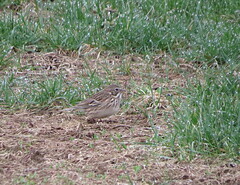 2 birds that are pretty dependable to get, however those are normally confirmation by call, not by sight. They can be rather reclusive even if their right in front of you. Which they were. 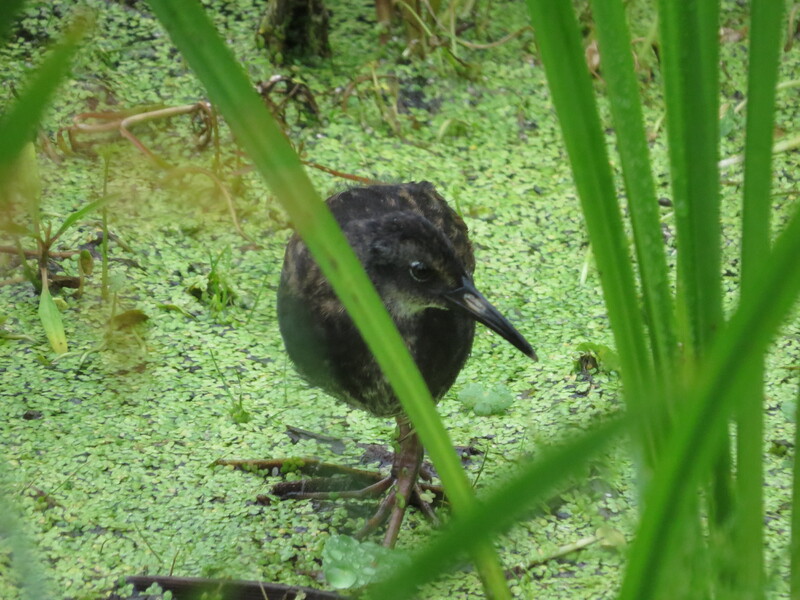 One of the leaders saw one fly from one clump of reeds to another, so anticipation was high. Then were heard one call. Then another right next to it. But they were calling just feet from the boardwalk. So as the group gathered around my thoughts went back to our morning talk about not having too any people jammed into one spot. 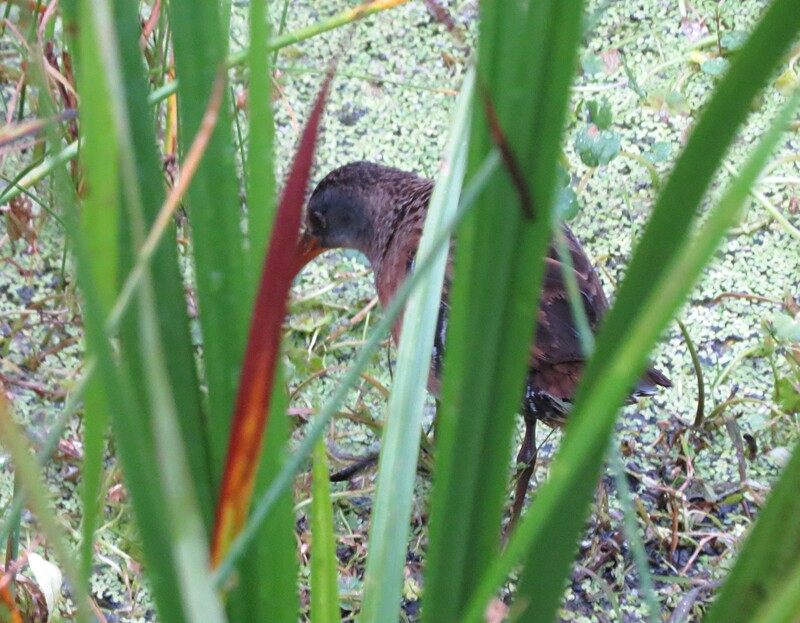 Well, when it comes to a Virginia Rail we throw caution to the wind and hope for the best. I stood and watched as I could see the water under the boardwalk ripple from the birds. 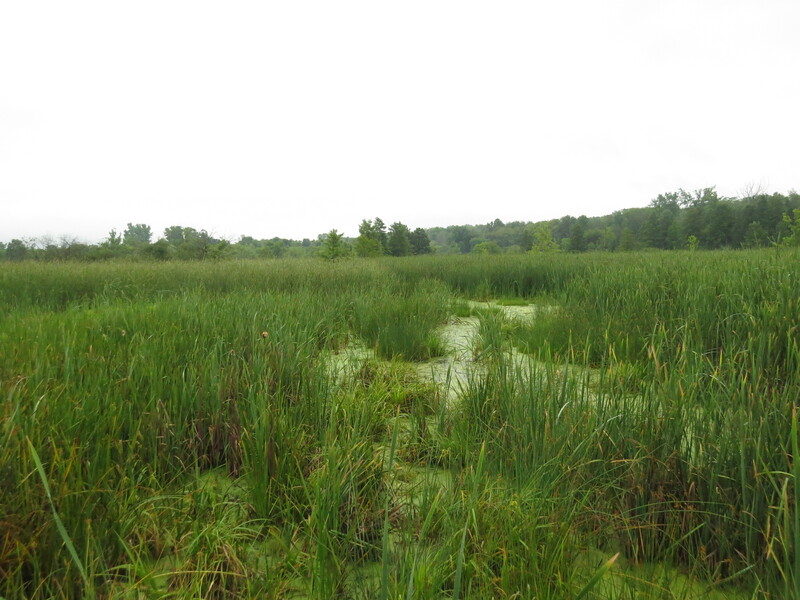 The reeds are so thick it’s real difficult to spot one through such a tangled mesh. They kept calling as they moved away and parallel to the open water. Then Ann, one of our group leaders called out that one was coming out into the open. Not being one of those pushers and shovers I moved to my left and pulled out my camera. 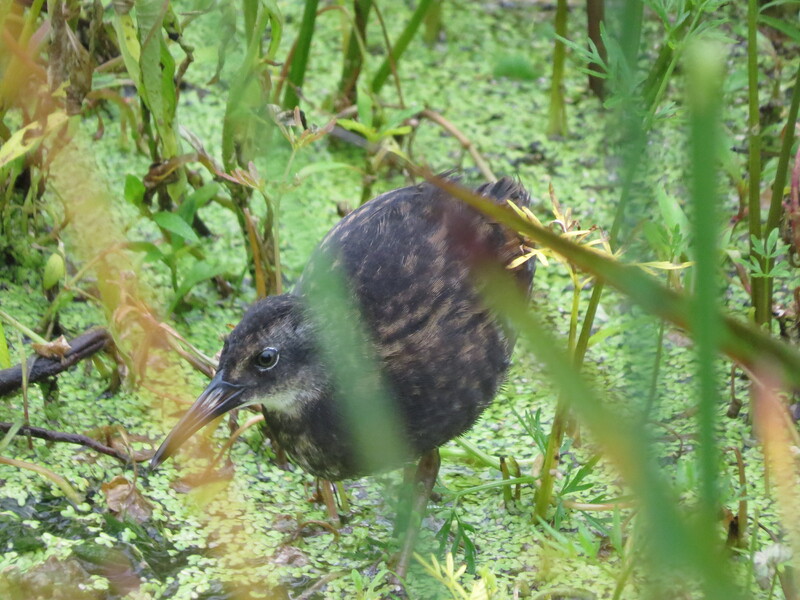 Here’s the first one as it exited the reeds and worked it’s way across the open flat of water and grasses. Still the first one. 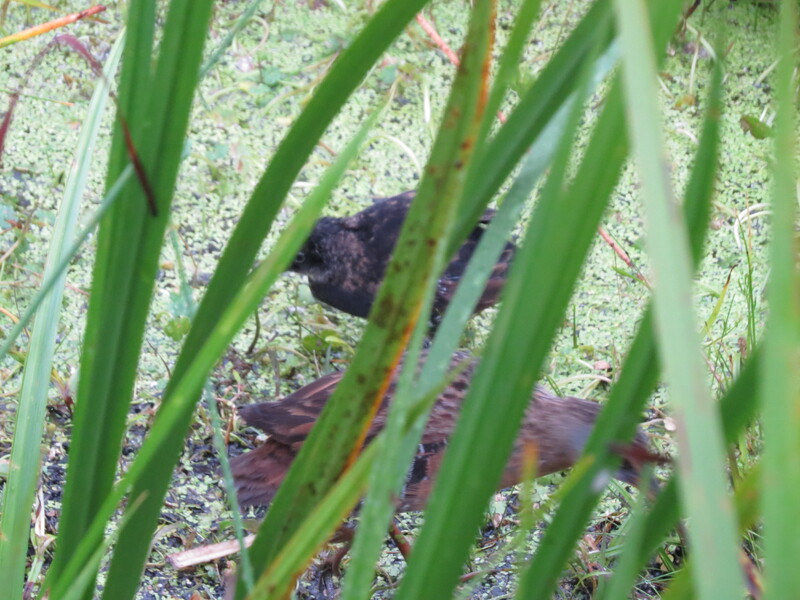 I never was able to get a picture of the 2 together as they both turned tail and flew into the reeds across the opening never to be seen again. 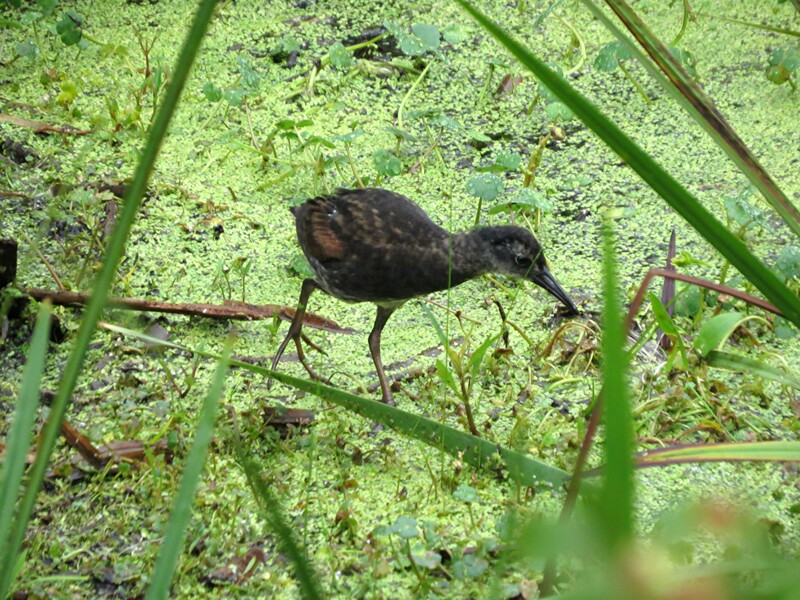 I just love Rails, they poise such a problem for us birder. Secretive, quiet and stealthy. Except when they call, then all hell breaks loose. They can be rather LOUD! 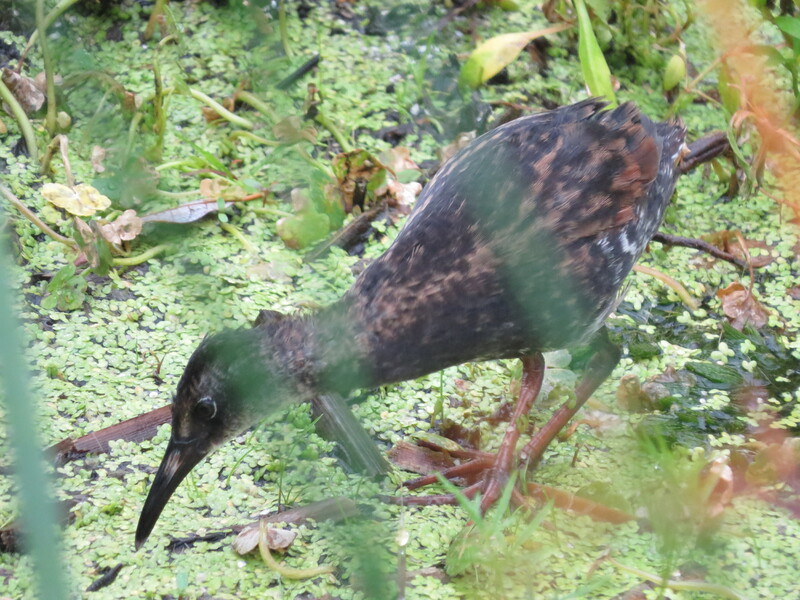 All in all a super morning, and to top it off I meet up with birding friend Gail Wulker as we nailed a Sora calling just feet again from the boardwalk as the group departed, missing out on another great bird. It pays to be patient with these buggers.